Master Shin will have a demonstration at Wold Seido Karate Organization's 33rd anniversary tournament! Seido Karate is a Japanese traditional style. There are so many things to write about Seido...its style, its training, and its philosophy. Please visit Seido.com for more information. 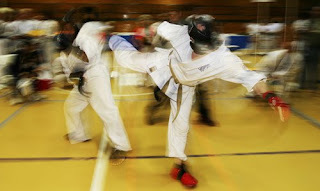 Even if you are not interested in martial arts, you will find it very interesting. Karate is not only for fighting. It's way of life. Seido's founder Kaicho Tadashi Nakamura is a long time friend of Master Shin. Please stop by at the tournament and experience Master Shin's Ki-Energy Healing Thearpy! (1) First, I am very much interested in working with doctors as referral basis. If you are a doctor or any other medical professional who face difficulties of improving or curing the patient’s condition after administering series of testing and/or providing many medications, please feel free to refer him/her to my office before going for further testing, medicines, and/or surgery. I have a special ability to use universal energy called Ki(Qi) to improve or heal any complicated diseases quickly and completely without using any drugs, shots, and/or surgery. When I face an individual with a physical, mental and/or medical problems, I first infuse Ki(Qi) energy to lose tight muscles and organs. Then, I correct a misaligned spine, if any, to increase nerve function. Most condition can be quite improved by this point. But, if needed, I infuse　additional Ki(Qi) energy to facilitate the flow of lymphatic system and the hormone secretion in order to increase the immune system. So, when you feel that you can not help a patient any more please feel free to refer him/her to my office, Tel. 201-447-7040. I am willing to accept anyone with any complicated problems from low back problem, migraine headache to rheumatoid arthritis, chronic fatigue syndrome, hormone disorder, and cancer. (2) Second, I am also interested in working with doctors in the field of oncology and/or palliative care who treat cancer and other terminal illnesses. I have provided Ki(Qi)-energy therapy to people with thyroid, cervical, liver, leukemia, lung, stomach, prostate, and breast cancer. People with prostate, thyroid, and cervical cancer received Ki(Qi)-energy therapy only, and others received chemo and other treatments provided by MDs before, during, and/or after my therapy. Most of those who received only my therapy became cancer free after 10 to 16 sessions. On the other hand, those who received my therapy along with other treatments such as chemo, their conditions changed quite differently from one person to another. Often, once the individual started receiving chemo therapy, his/her condition became worse than before, and sometimes it leads to death even though his/her condition was much better while receiving my therapy (i.e., the size of tumor reduced, blood reading improved, more energy, etc). Unfortunately, chemo therapy treatment is often not so effective or safe, but rather ineffective and dangerous. It not only kills cancer cells, but also many healthy cells including white blood cells. As a result, a patient’s immune system levels go down to unsustainable level. Although Ki(Qi)-energy healing therapy is not medically and/or scientifically proven its effectiveness yet, I strongly believe that if Ki(Qi)-energy is properly used, it is quite possible to guide drugs such as chemo to certain organs much more effectively, most likely 25 to 75% more. So if you treat cancer patients and interested in working with me utilizing this simple yet very effective natural energy healing therapy method, please contact me. I am willing to work with you to help people suffering with cancer. I am looking for medical researchers who are interested in doing research on my Ki(Qi)-energy healing power. I am gifted to utilize Ki(Qi)-energy freely to eliminate pain and to heal one’s problem quickly and safely without using any drugs. I strongly believe that my Ki(Qi)-energy healing therapy method can be the best alternative medicine of the 21st century. However, unless it is medically and/or scientifically proven, it is very difficult to convince people how beneficial my therapy can be. Therefore, if you are a medical researcher and have an interest to do research on this unprecedented natural healing power, please contact me. more effective than any others existing methods. Aren’t you interested in doing research on my Ki(Qi)-energy power? I would like to provide Ki(Qi)-energy healing therapy for professional as well as high level serious athletes. The reason is that my Ki(Qi)-energy power is able to heal athletes’ muscle and/or joint injuries/problems very quickly without using any drugs, shots, and/or surgery. Most injuries can be healed by several treatments. No any other methods can be as effective and safe as mine. Comparing with any other methods including western medicine, chiropractor, acupuncture, Reiki, and others, the Ki(Qi)-energy healing therapy is at least 50 to 100% or more effective than those methods. My Ki(Qi)-energy power is also possible to increase your maximum performance by 5 to 15% naturally. So if your are serious athlete and interested in either healing your injury quickly without using any drugs, shots, and surgery or increasing your maximum performance, please come and see me. Since my Ki(Qi)-energy power is not unlimited for use, I am very much interested in using this energy to help high level serious athletes. If you are interested in working with Master Shin, please contact us! She had unsolvable digestive problems for the last six years. She could not only eat, but also throw up many foods including pizza which she used to love the most. She had visited many medical professionals but no help. Her mother strongly recommended her to come to my office. In the first two sessions, nothing had happened. But in the third session, I found the main cause of the problem. So, I said to her, “You will be able to eat pizza after next session”. She simply could not believe it.